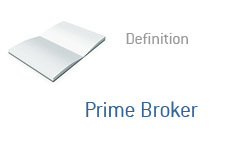 Prime Broker - What Does It Mean? What is a "prime broker"? What is the definition of a "prime broker"? Who would use a "prime broker"? "...the generic name for a bundled package of services offered by investment banks and securities firms to hedge funds and other professional investors needing the ability to borrow securities and cash to be able to invest on a netted basis and achieve an absolute return". Prime brokers will clear, provide custody of assets, lend and finance (for the purposes of leverage), as well as offering a number of other services that are instrumental to the success of any hedge fund. Some prime brokers will take their offerings to an even more personal level, including introducing hedge fund clients to potential investors, subleasing office space and more. A prime broker is an invaluable part of any hedge fund operation.